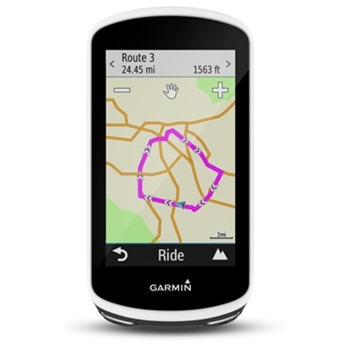 Your next cycling adventure should not be without the Garmin Edge 1030. The 3.5-inch color display is sunlight readable and offers a sleek mounting design that stays flush with your handlebars for a low-profile look. Compatible with a large variety of Garmin accessories, customization has never been easier. With features geared towards all cyclists, competitive or commuter, this is a great option for all. The Edge 1030 boasts a long battery life of up to 20 hours, which can be extended to 40 hours with the optional Garmin Charge power pack. Add additional mapping to enhance the detail of the included basemap. Store up to 200 waypoints and 100 courses. The included barometric altimeter and accelerometer allow the Edge 1030 to provide accurate stats like speed and temp. The 1030 Edge is also fully customizable with free apps, widgets, and data fields to stay connected. 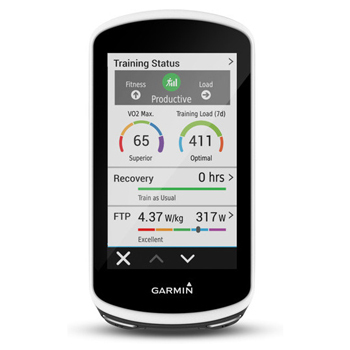 Simply download the free Garmin Connect App and your Edge will automatically transfer your data so that you can view and analyze your stats. Advanced navigation and Cycle Maps work together on and off road giving you the most detailed, turn by turn navigation along with elevation data and points of interest. The Garmin Edge will alert you to upcoming sharp turns and rugged terrain so that you’re aware and prepared for what lies ahead. Popularity routing is another desirable feature of the Edge 1030. View billions of miles of data uploaded through the Garmin Connect app and see the Trendline popularity routes that your fellow cyclist like or ride on a regular basis. Whether you prefer to ride in a group, or if solo cycling is your preference, stay connected with family and fellow riders. Rider to rider messaging allows you to quickly send preset messages like “Wait at next stop” to other cyclists. With this feature, you can ride at your own pace and re-connect at your next stop. Your Edge 1030 also acts as a communication hub to the outside world allowing you to view phone calls or texts. You can then respond with preset messages like “I’m OK” or “Be home soon”. The LiveTrack and GroupTrack features allow fellow riders and family back home to see your rides in real time so that have peace of mind that you’re OK. Ride with confidence with the Garmin Edge 1030. Each Garmin Edge 1030 Bike Computer comes with: Edge 1030, Mounts (Standard and Extended Out-Front), USB Cable, Tether, Manuals, One-Year Manufacturer’s Warranty.